Fascia, as Rolfers view it, is essentially all of the connective tissue in the body. Rich in collagen fibers, it can be a tough, gristly covering, much like a sausage casing, that surrounds every muscle. It forms a vast network throughout the body, surrounding every other cell and continuous from head to toe. 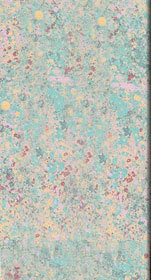 It is the white tissue in the pictures shown here. It also includes the tendons that join the muscle to the bone, as well as the joint capsules and the ligaments. 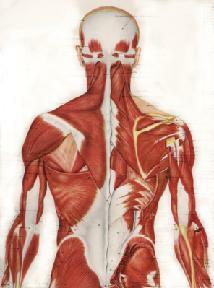 Fascia contains numerous nerve fibers and sensory receptors and is better termed, neuromyofascia. The superficial fascia, directly under the skin, contains adipose tissue and collagenous fibers and is also rich in nerve fibers. This layer can be very much involved in holding the twists in the deeper tissues and the counterrotations in our joints. Scar tissue and adhesions are basically the same as fascia, only very disorganized and more restrictive. In some places the fascia is thinner than nylon pantyhose, but in other places, such as the IT band on the outside of the leg, it can be much thicker. It is also extremely strong. The fascia thickens and hardens where there is chronic tension and where the nerves passing through it are mechanically irritated. Because it forms a continuous network throughout the body, and because it is so strong, Rolfers consider fascia as the "organ of form." Thus, the fascia dictates our shape and freedom of movement. In addition, all nerves and blood vessels run through the fascia. (See photos at right and below.) Therefore, if the connective tissue is tight, the associated tissues will have poor nutrient exchange. This exacerbates any painful situation because toxic metabolic waste products build up and this further aggravates pain receptors. Tethered nerves can be tugged and overstretched, leading to neurogenic inflammation.This creates a vicious cycle by creating more muscle tension and fibroblast contraction, leading to further thickening and hardening of the fascia, which, in turn, further limits mobility. Fascia from behind the knee (top image) and on the shin (bottom image). 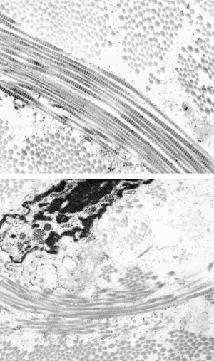 Note small blood vessels in the lower picture. 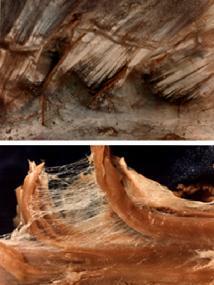 Fascia from the underside of the sternum (top image). Note how the fibers look like crystals. 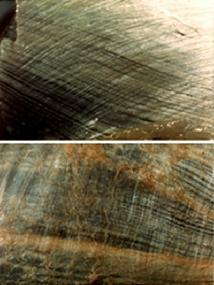 Fascia extends between individual muscle fibers which have been teased out from the gluteal muscle (bottom image). Fascia tends to stiffen as we age becoming tight and dried out. Under inflammatory conditions, the body's lubricative material can become more glue-like, helping to attract more inflammatory cells and adhering various layers together. The manipulations of Rolfing help to stretch, loosen and rehydrate the tissue so it can be more supple and resilient, and restore glide to the nerves. We don't have to get stiffer and stay that way just because we get older. Color photos by Ron Thompson. At much higher magnification, we see that the large collagen fibers are composed of bundles of even smaller collagen fibrils. 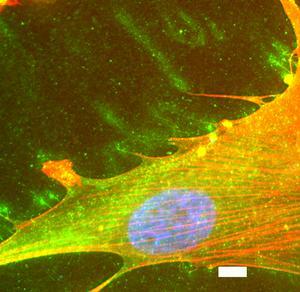 In the bottom image, we can see a fibroblast, the cell that makes the fascia, in between the fiber bundles. The spaces between the fibrils are filled with the watery, gel-like matrix that can either be slippery or sticky. For example, the matrix is stickier under inflammatory conditions, leading to trapping of inflammatory cells and increased contraction by the fibroblasts. This can create more tension in the tissue as a whole, leading to an adverse cycle of tension and inflammation. Intervening in the process by physically relieving the tension and opening the tissues through manipulation, can help break that cycle. A fibroblast, or resident cell of the connective tissue that was treated with an inflammatory mediator secretes hyaluronic acid (shown by the green staining). Under inflammatory conditions, the hyaluronic acid is in a sticker form. The actin fibers that are responsible for the contractile properties of the cell are stained red and the nucleus is stained blue.